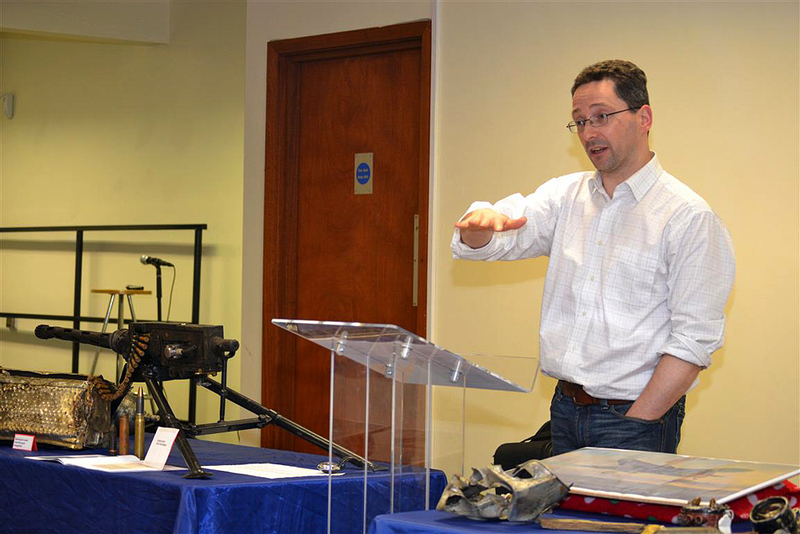 On Thursday last, February 27, we had the great pleasure to welcome Jonny McNee as our guest speaker, an aviation historian, who’s determination and efforts led to the recovery of a lost Spitfire in the bog of Glenshinney, Moneydarragh, near Gleneely. His extensive research would not only add a nearly forgotten chapter to Inishowen’s past but also form new and strong bonds across the Atlantic. Why, you could ask, is a 2 ½ year old story about an aircraft excavation worthy of retelling in 2014? Quite simply, it is because the story grew from the young volunteer American pilot parachuting to safety from his stricken aircraft over Donegal to become headline news 70 years later in Ireland, America and Canada. The following catapulted the story of Spitfire P8074 onto a global stage. I had been asked by a television production company, working for BBC Northern Ireland, to research a number of WW2 plane crashes that could possibly feature in a forthcoming BB NI series to be called ‘Dig WW2’ The aim of the series was to tell the pivotal role Northern Ireland played during WW2, both at home and across numerous foreign battlefields through investigating the remaining archaeology and undertaking excavations. 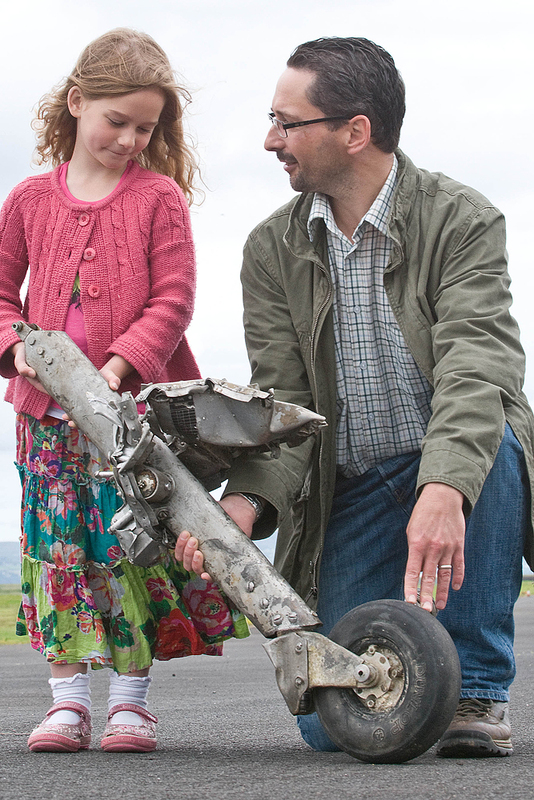 In January 2011, with my daughter Grace in tow, I set off into the hills of the Inishowen Peninsula to look for a long lost Spitfire crash site. It was the proverbial needle in a haystack search. As we approached the small village of Gleneely, Grace announced that she wanted a packet of chocolate buttons adding that “chocolate buttons help you find planes!” We stopped at a small petrol station and while we were in the shop fate, or call it what you will, decided to shine on us that day. Over the next 5 minutes and quite by chance, everyone who knew a bit about the story came into McLaughlin’s Filling Station, culminating with a man who offered to take Grace and me to what he thought was the crash site. He pointed out a slight crater on the edge of a small stream that had a few corroded bits of aluminium hidden deep under the rushes and heather. I obtained a search licence from the Irish archaeological authorities for the production company and the film team to come to this desolate location to film a search for the specific impact point to ascertain what if anything remained buried at the site. At great expense, we searched all day and found absolutely nothing. Reluctantly in the fading light, the producer called it a day and the team trudged off the moor. Another member of the search team and myself were bringing up the rear as we snaked back towards the cars. Suddenly he fell in a patch of heather and landed on the peat surface beneath. It rippled! Then our detectors started screaming! We had fallen into the crash site! The camera team hastily reassembled in the gloom and filmed us happily pointing out the possible locations of machine guns and the Rolls Royce Merlin engine buried deep beneath the peat. Although the producer and I were outwardly very happy at finding this aircraft, inside we were both very troubled. There was only a small budget for each aircraft excavation. This aircraft was buried 33 ft in the peat, ¾’s of a mile from the nearest road and in the middle of a waterlogged peat bog. I chose to overlook this slight technicality and threw myself into researching the history of this aircraft and its pilot. My research revealed the pilot was P/O Roland “Bud Wolfe from Nebraska, USA who volunteered to fly with the RAF before the US entered WW2. In 1941 he was assigned to 133 Eagle Squadron (RAF) at Duxford. There were sufficient American volunteers to form three Eagle squadrons – 71, 121 and the 133. In October 1941, 133 Squadron moved to RAF Eglinton just outside Londonderry. The airfield is now the City of Derry Airport. On the 30th November while flying a convoy patrol of the northern tip of Ireland, his Mk IIa Spitfire developed a coolant leak and he was forced to bale out as he returned to base over the Donegal hills. Unfortunately he landed in neutral Eire, as the Republic of Ireland was then known as, and he was promptly arrested and interned in the Curragh Camp in Co Kildare. Bud decided he had no intention of staying put and enjoying the parole system that enable the camp inmates – both Allied and Luftwaffe crews, to leave the camp daily under oath to enjoy the Kildare countryside and its hostelries. RAF Pilot Officer Bud Wolfe in his uniform. Collect from Marton McKeown. 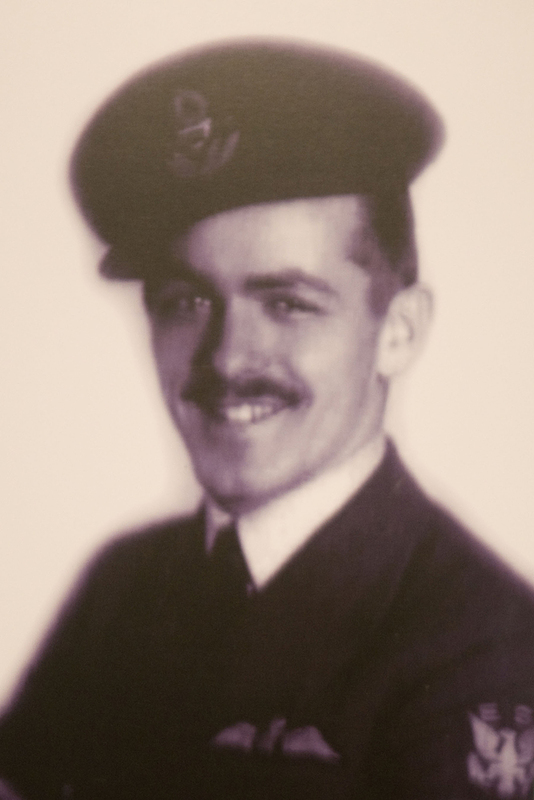 On the 13th December 1941, taking advantage of lapse security at the prison gate and exploiting a technicality in the parole system, Bud walked out of the camp and returned a few days later to his RAF airfield in Northern Ireland. To his disgust, he was promptly re-arrested by the RAF and 10 days later, he was returned to the Curragh camp. His escape had caused an international political furore that threatened Irish neutrality. Eventually the Air Ministry decided that, rather than threaten a potential German invasion of Ireland or upset Irish neutrality Bud should be returned to the camp. There he remained until 1943 when the camp was closed and the inmates returned to the UK. Bud flew on with the US Army Air Force until the end of the war. He later flew with the US Air Force flying jets in both the Korean and Vietnam wars. He passed away in 1994. Then I discovered the aircraft was the very first presentation aircraft present by the successful Canadian businessman Garfield Weston. His donation of £100,000 in 1940 to Lord Beaverbrook, a fellow Canadian who headed up the Air Ministry, resulted in the creation of the Spitfire ‘Wings for Britain’ funds whereby communities across the UK could band together to raise a nominal £5,000 to buy and name ‘their’ Spitfire. Garfield Weston presented 8 Spitfires and ours, P8074 was ‘Garfield Weston 1’. This name was painted down the side of the fuel tank, just in front of the cockpit. I also managed to trace the pilot’s elderly sister and his two daughters in America to seek their blessing for the project. As was typical with veterans from our greatest generation, he had talked little about his war time experiences with his family. 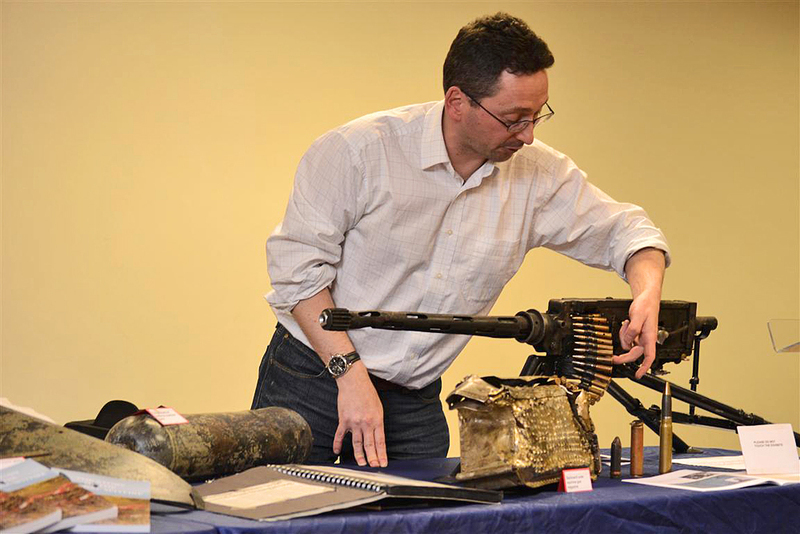 On the 28th June 2011 from 33ft beneath the peat and clay, some of the most significant items we recovered where 6 Browning .303 machine guns, most of the cockpit controls, the pilot’s helmet, the First Aid kit and possibly the prized find, the piece of the fuel tank with ‘Garfield Weston 1’ stencilled on it. Seven years old Grace McNee and Jonny McNee with the rear wheel assembly from the Spitfire which was recovered recently from a peat bog in Co. Donegal. 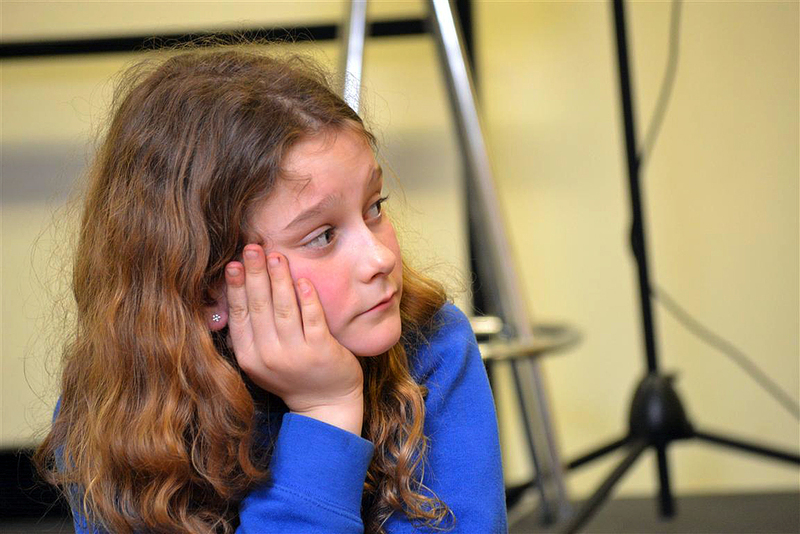 Picture Martin McKeown. The next day, the story had gone global. 800,000 people read the story in less than 24 hours on the BBC website. 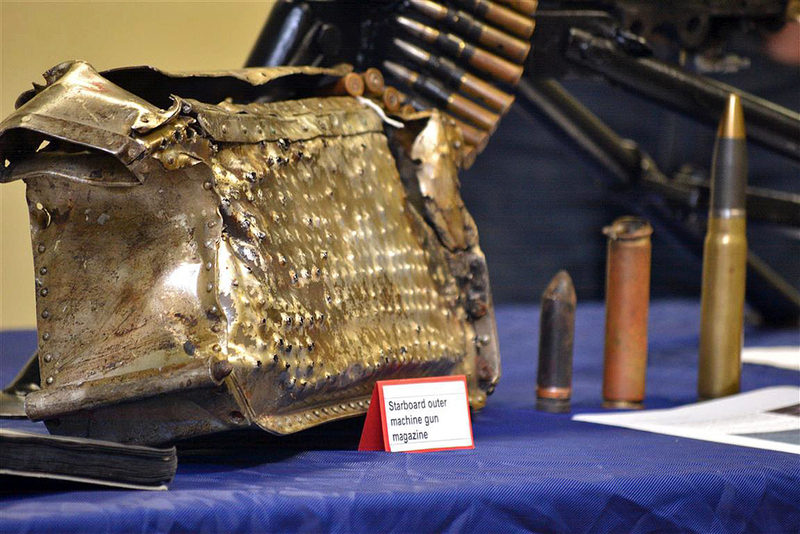 It was front page news across the UK, America and Canada In September 2011, Garfield Weston’s son Galen – a very successful Canadian businessman in his own right, invited my family and me to Toronto to present him with the stencilled piece of engine cowling with his father’s name on it. 200 Weston family and friends attended the evening. Could it get any better – it sure could! The Irish Defence Forces got in touch with me in October to say that they thought it was possible to get one of the machine guns to fire. A few weeks later they emailed me a video of it firing at one of their ranges. When I rang the producer to tell him of this revelation he was stunned! 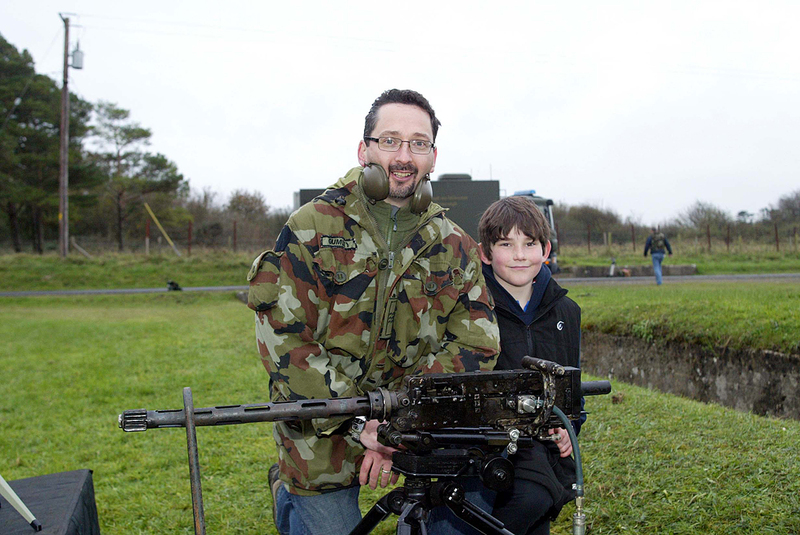 We hastily re-assembled the production team and presenter Dan Snow and headed to the Defence Force’s firing range in Athlone to film a further series of firings. I got to fire the final burst of bullets through the gun before it was made safe for public display. It was a very historic event. 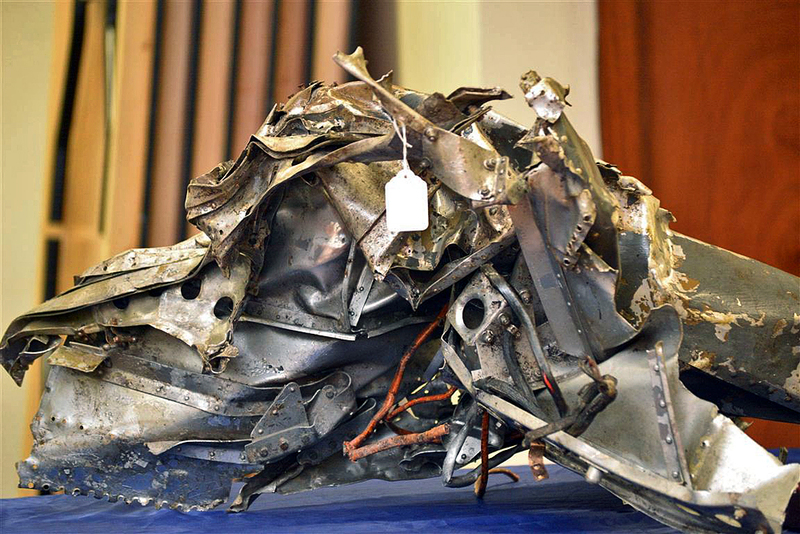 The gun had survived a 400mph crash from 6,000ft and had lain buried 16ft in the peat for 70 years. When the firing was shown on the BBC website 1.2 million people read the article in less than 24 hours. The exhibition of the most significant items recovered was launched in Derry City Council’s Workhouse Museum on the 1st December 2011. 14 of the pilot’s extended family attended from America, including his two daughters. It was a very emotional 4 day trip for them, which included a visit to the crash site on the 70th anniversary of the crash. 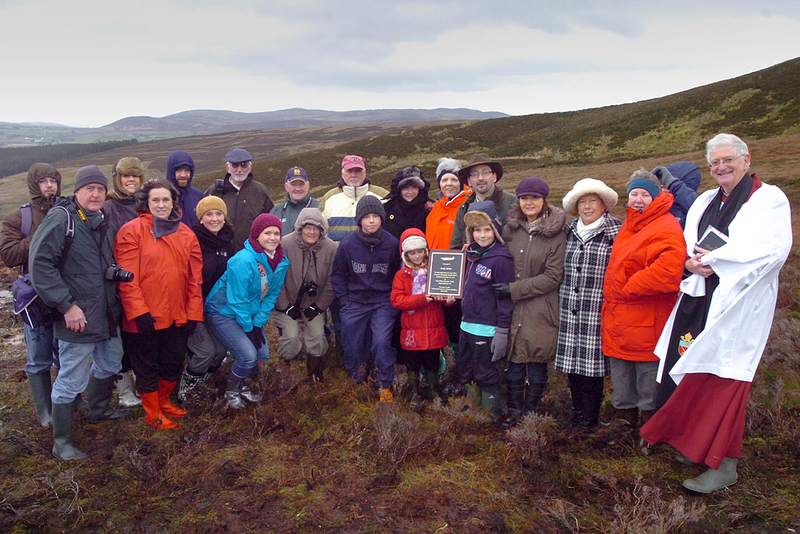 Family members gather at the site outside Gleneely were pilot Roland Wolfe's Spitfire crash landed. 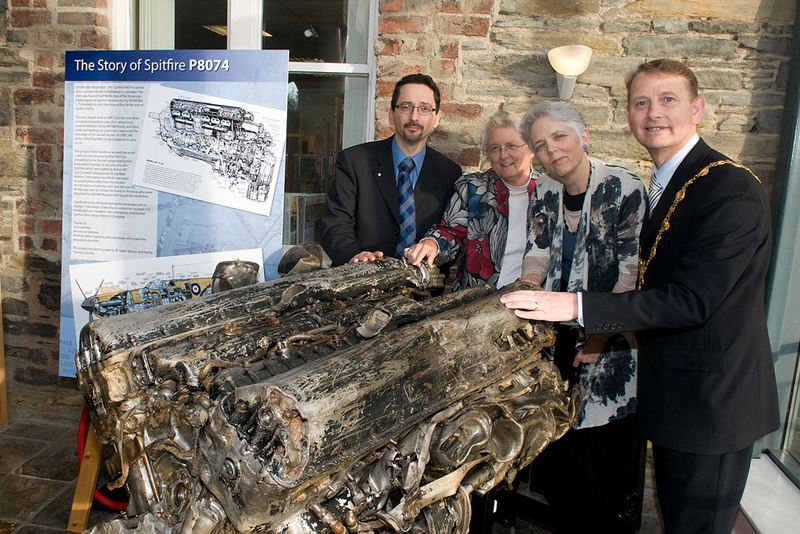 The Mayor, Alderman Maurice Devenney pictured with aircraf researcher Johnny McNee and sisters Barbara Kucharczyk, Betty Wolfe whose father, RAF Pilot Officer Roland "Bud" Wolfe from Nebraska, USA, took off on the 30th of November 1941 from what is now City of Derry Airport in his Spitfire. He was forced to bale out over Donegal when his aircraft developed engine trouble while taking part in a convoy patrol over the North Atlantic. He was taken into custody by the Irish state. 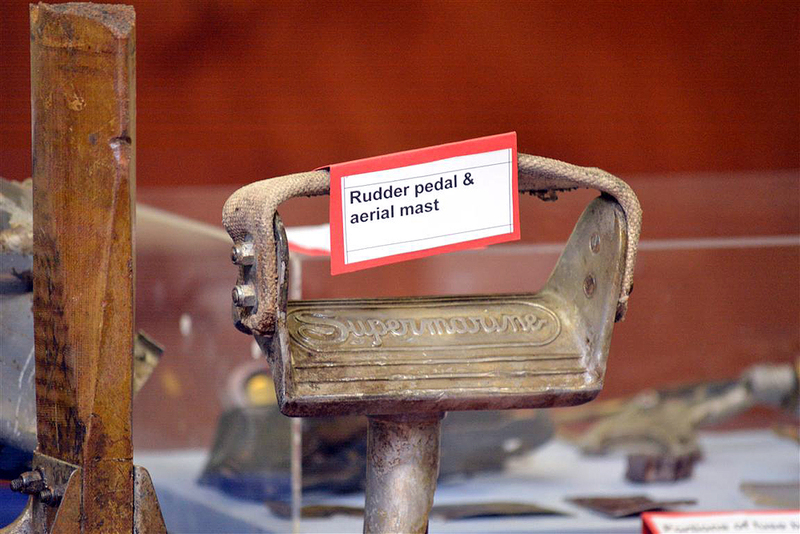 The aircraft was recovered earlier this year from the peat bog where it lay undiscovered for 70 years. 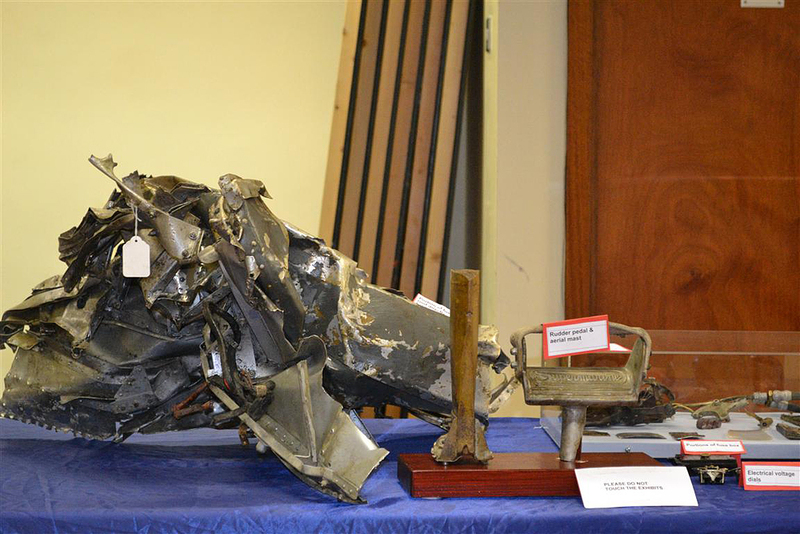 Items recovered, including the engine, propeller hub, pilots harness, and the rudder have from the plane have been placed on display in the Workhouse in Derry. Picture Martin McKeown. Our much cherished guest speaker - Jonny McNee. Photo Lisa Henderson. Retrieved from the depth of the bog. Photo Lisa Henderson. The amazing Grace. Photo Lisa Henderson. 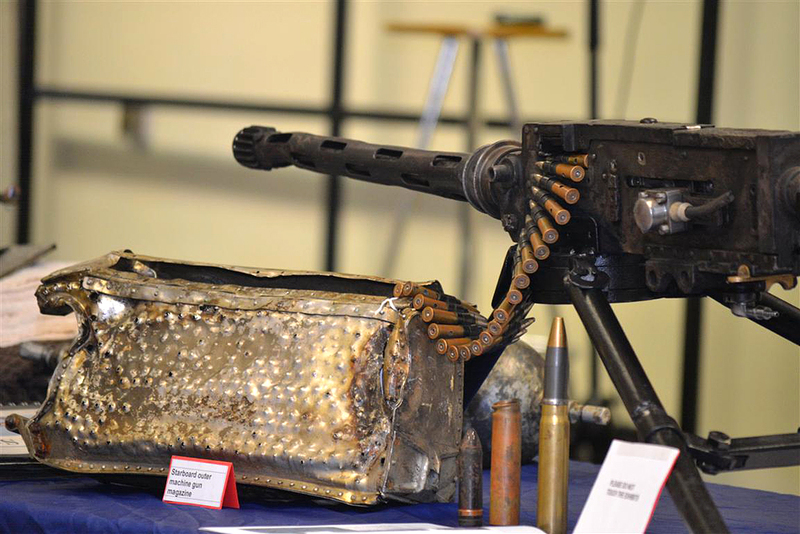 The Browning machine gun. Photo Lisa Henderson. The BBC 1 programme, Dig WW2 with Dan Snow, featuring our Spitfire.